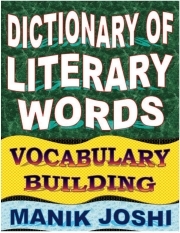 Description of "Dictionary of Literary Words (eBook)"
‘Literary words’ are associated with literature. ‘Literary words’ are typical of a work of literature and imaginative writing. ‘Literary words’ are used with a particular meaning, in narrative, drama, poetry and other writing in a literary manner. ‘Elevated language’ is widely used in literature. His leg ached because of injury. Their eyes flashed with horror. Reviews of "Dictionary of Literary Words (eBook)"